1. What sign is Oprah's Winfrey 4th House? 2. What is the Ruling planet of Oprah’s 4th house? 3. How many planets does Oprah have in her 4th House? 4. Which 4th house karaka planet is in Oprah’s 4th house? 5. In what House is the Planet, which rules the 4th House, placed? 6. What does it mean for Oprah Winfrey to have her 4th House ruler placed in the 4th House? 7. 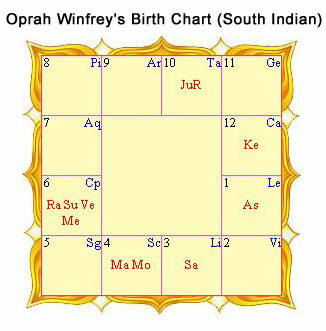 Which primary planet should Oprah propitiate via mantras, gemstones and fire rituals to help further increase her property, home and happiness fortunes?